I find inspiration in the most unlikely places. Often in recipes that call for an ingredient I can’t get my hands on. That was the case with this recipe. I was looking at cassoulet recipes and one called for “French Garlic Sausage.” I had never heard of it, and garlic always sends me scurrying to find out more. I love garlic. There are a few recipes for it, but the most intriguing was one that had chopped pistachios in the mix. Yup, nuts in a sausage. They looked great. Not one to back down from a challenge I bought pistachios the next time I was at a grocery. They are not cheap. To mitigate the wallet shock buy them at a bulk food store. And resist the urge to get the red ones. They’re dyed. Buy unsalted, shelled green. I usually grind my own pork, but this time I opted for the far easier pre-ground. It was on sale... Lucky I did because I discovered an “issue” in the stuffing process. It had to do with the nuts. When you use a sausage stuffer the meat passes through the grinder (without the grinder plate) and past a small plastic spacer before it goes through the stuffing tube. As I tried to stuff I noticed the meat wasn’t coming out very quickly. When I investigated I found the nuts were getting clogged up. 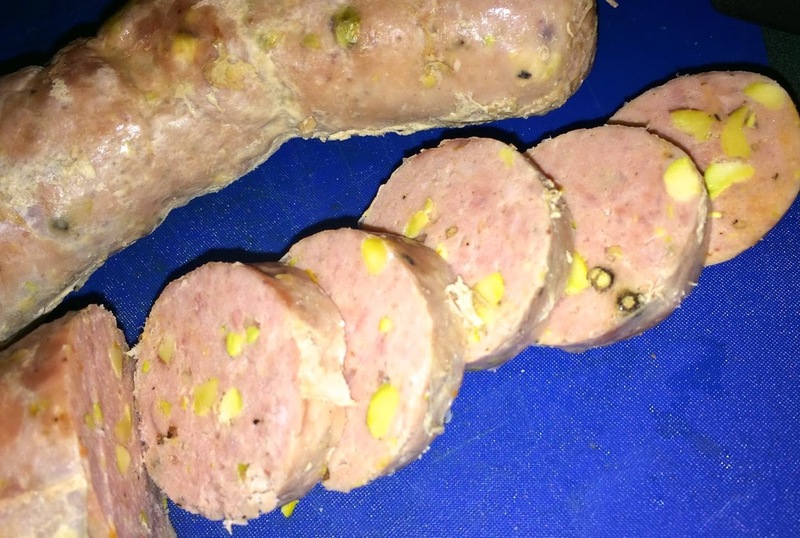 So I had to stuff all the sausage into the casings by hand, through the tube, with my finger. A time setback, but I’ll know better next time. This sausage has to cure for 3 days. Because it has sodium nitrite the finished product is also pink, kind of like a hot dog. The consistency also reminded me of that a little. It was very smooth. 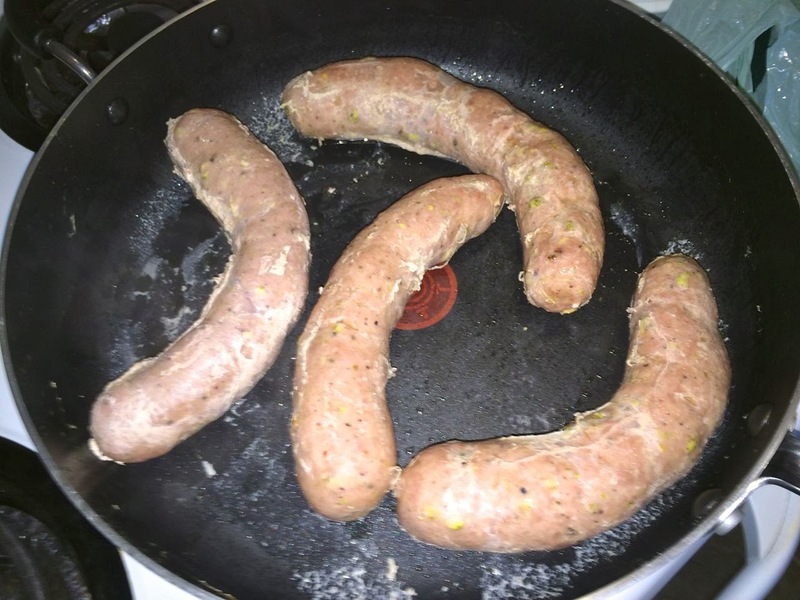 I made these sausage for a French Lentil Soup. The recipe will follow this one in a couple days. If you’re looking for a bit of an interesting sausage for the barbecue, or have cassoulet on your radar, give this one a try. They won’t disappoint! This is the whole 1 kg after simmering for an hour. Pulse the whole peppercorns and garlic until garlic is ground. Add the pistachios and pulse until broken into medium sized pieces. Do not grind fine or the nuts will start to go into a paste. The peppercorns will still be fairly whole as well. 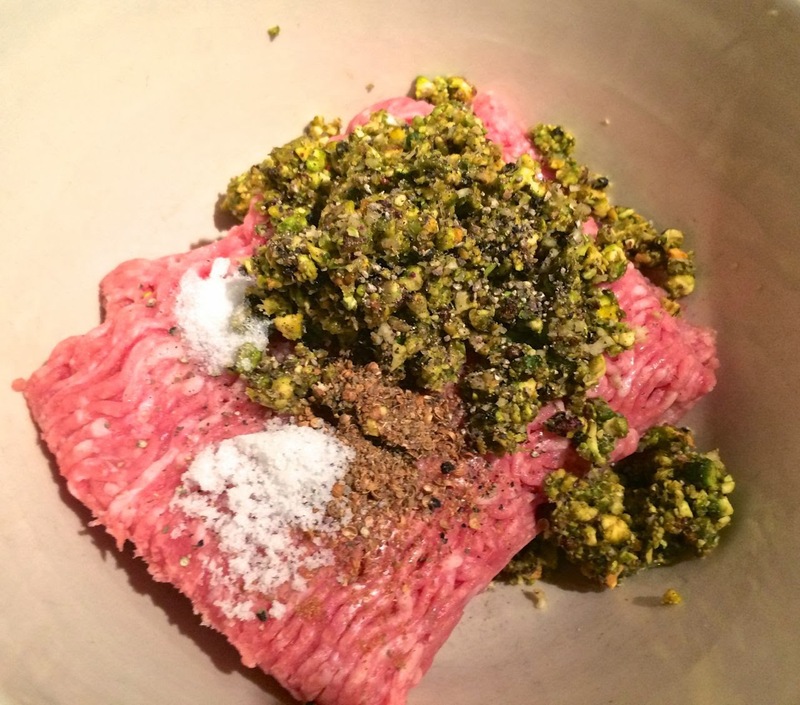 Add this mixture to the pork in a bowl. Then add the coriander, cracked black pepper, brandy, water, sodium nitrite and salt. Mix with your hands until well combined. The meat should be quite smooth. Let rest for 15 minutes. Then stuff into sausage casings and twist into links. Make 8 if using for barbecuing, or fewer if slicing for in a dish like cassoulet. You can even leave it just one big coil. Let cure in the refrigerator for 3 days. * After 3 days, bring water to a simmer in a covered pan large enough to accommodate the sausages in one layer. Add the sausages, bring back to a simmer, cover and let cook for one hour. Remove and refrigerate until ready to use. You can also freeze either uncooked or cooked. *If barbecuing, you can omit the simmering step and put directly on the grill until browned and cooked through.